The HTC One M9 packs the same 5-inch screen as the One (M8) and that is no bad thing. It's a high-quality IPS panel of 1080p resolution, which delivers 441ppi. 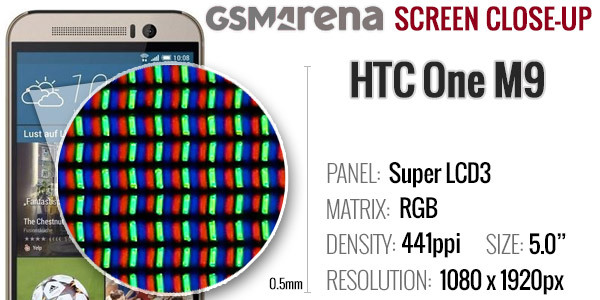 While not record-breaking numbers, individual pixels are nonetheless indistinguishable to the naked eye, and HTC maintains QHD would be an overkill at this diagonal. We are somewhat inclined to agree. The panel features a standard RGB matrix with equal number of subpixels for each color. The display is covered with the latest Gorilla Glass 4 for scratch and shatter protection. A dedicated glove mode can be enabled to improve touch sensitivity, but as always that comes at the expense of battery life. We ran our typical testing routine and the numbers proved our initial suspicions that the panel in the One M9 has been carried over from the predecessor. And that should be taken as compliment. The One M9 posted great scores in the contrast department, even if maximum brightness is slightly lower. The 50-percent setting delivers almost precisely a third of the maximum brightness while contrast remains solid. Sunlight contrast ratio on the other hand was less impressive. The One M9 posted average results, just like the previous generation. You can read more about our standardized display testing procedure. The HTC One M9 comes with a slightly higher-capacity battery than its predecessor, which in turn improved over the original One. The latest generation's cell packs 2,840mAh of juice, a good 11% more than the Samsung Galaxy S6's 2,550mAh. The One M8 posted excellent scores on Android KitKat, and the Lollipop update brought massive improvements in web browsing, even if video playback and talk time took a hit. So we kicked off our battery testing routine expecting solid performance, having in mind the larger battery that needs to light up the same-sized screen. In the end, the results turned out less than impressive. While 3G talk time is solid at almost 21 hours, the seven and a half hours of web browsing longevity raises eyebrows. Remember that the Android 5.0 update brought the predecessor's figures in this department to twelve and a half hours and even on KitKat it managed a good 9 hours. The One M9's video playback stamina was underwhelming as well, and the 8:21 hours are close to 2 hours less than the previous generation. For comparison, the Samsung Galaxy S6 lasted 10:24h in video playback and 8:44 in web browsing, while packing a smaller battery and feeding a significantly higher-res screen. 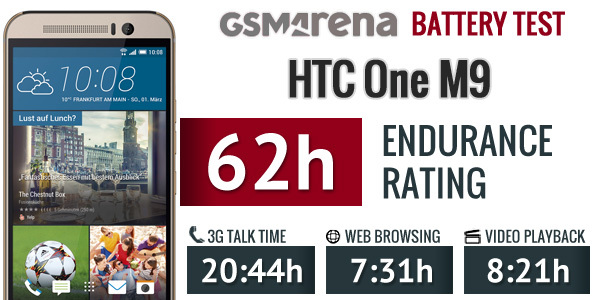 The Galaxy didn't fare as well in talk times though, where the HTC One M9 beat it by over 3 hours. All that said, the One M9 should last you around two and a half days if you do an hour each of voice calls, web browsing and video playback per day. Understanding that no two users are the same, we've provided a handy tool that will give you a clue what autonomy you can expect with your specific usage pattern. Our routine also includes a standby battery draw test, which is not on our battery test scorecard but is calculated in the total endurance rating. Our battery testing procedure is described in detail in case you want to learn more about it. You wouldn't be surprised to find out that the One M9 comes packed with connectivity options. For starters, there are quad-band 2G and 3G radios and Cat.9 LTE for download speeds of up to 410Mbps over 10 bands. Naturally, a GPS receiver is also built in with GLONASS support, which utilizes Russian satellites and helps in pinpointing your location thanks to the extra satellites in the sky. There's an FM radio receiver as well. Local connectivity features include Wi-Fi 802.11 a/b/g/n/ac (both 2.4GHz and 5GHz bands) with Wi-Fi Direct and Wi-Fi Hotspot. The HTC Connect feature works over the DLNA protocol to provide smoother integration of your phone to your home-entertainment setup, for supported devices of course. Those include multi-room speakers adhering to the Qualcomm AllPlay standard; DLNA and Miracast-compatible devices, Bluetooth speakers, as well as HTC-certified devices carrying the HTC Connect logo. If you prefer the old school way of controlling home appliances though, the IR blaster along with HTC's PeelSafe Remote app are up to it. Bluetooth 4.1 is on board, which sorts LTE interference issues. Version 4.1 is said to be more power efficient and supports direct communication between connected peripherals, keeping your smartphone out of it. 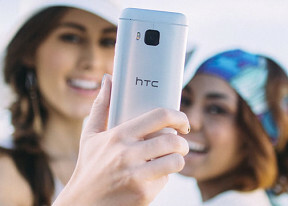 The One M9 comes with the necessary hardware to support NFC, but the functionality will be market/operator dependent, and HTC advises prospect buyers to check beforehand if the feature is a top priority. An MHL-enabled micro-USB 2.0 port sits on the bottom of the phone and lets you stream video to compatible TVs via an appropriate MHL HDMI dongle. USB host is enabled, for connecting external storage. A standard 3.5mm headphone jack lets you plug in your headphones of choice. The One M9 accepts nano-SIM cards. The microSD slot lets you extend the 32GB of built-in storage to up to 2TB, although we are yet to see such a monstrous card in the real world. Much like on the One M8, you also get the entire lot of sensors, including ambient light, proximity, accelerometer, compass, gyro and magnetic sensor, and a Sensor hub for discrete capturing the motion data, relieving the main hardware from this responsibility.